Olympic Fine Foods process and package a wide range of quality products including peanuts, nuts, seeds, sesame, soy, cereal grains, products containing sulphites (preservative). This product may therefore contain traces of those ingredients. 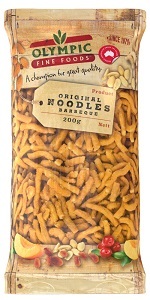 Love our Noodles Original BBQ product?